Site selection focuses on answering questions related to "where" . . .
Where are your best prospects? Where are your current stores and your competitors'? How Many Stores in a Network? Analyzing the answers to the questions of where gives insight into the question of "how many." How many suitable markets exist in a given geographic area for the products/services you offer? 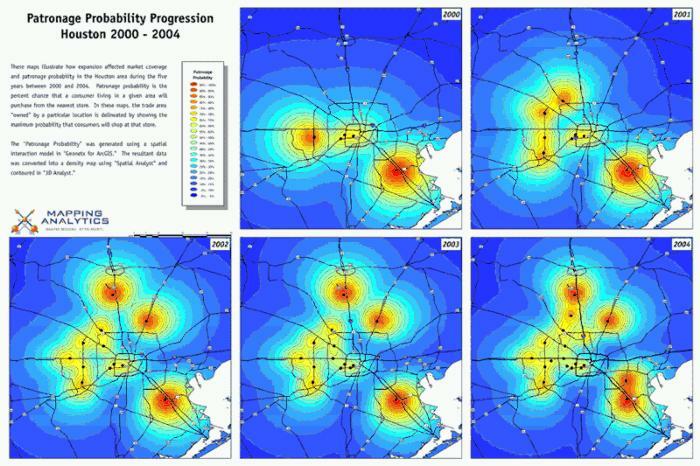 How many locations are necessary to optimally cover a given market area? Which locations offer the greatest potential? The answers to these questions provide actionable information that can help you build a network of stores/branches to take full advantage of market opportunity. It's the kind of information decision makers receive when working with Mapping Analytics. Can you add stores or branches without cannibalizing business from existing locations? Our analysis of existing store trade areas and overall market potential will identify gaps in your network coverage and point out areas that offer the most opportunity. Which areas offer the greatest market opportunity combined with the lowest risk? We will profile the demographics and market potential in the trade areas around your most profitable stores and use this information to rank potential markets for expansion. All the way down to sales projections for potential store locations. When you work with Mapping Analytics, you get the answers you need. And the site locations to be profitable. When stores are added, the entire store network changes. An inflection point occurs at the ideal number of stores in a market area.